For an SPV plant to perform and work properly and we can tap all the sun energy with our system which we can. 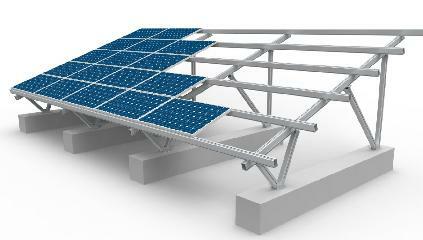 Solar Mounting Structure is the most important part of the SPV system. 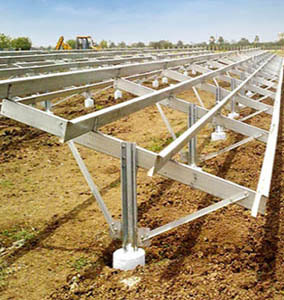 In the solar mounting structure the most important part is the steel which all gives strength and stability to the structure for this is most important the the structure can withstand all nature calamities, wear & tear. It is a general concept of conventional structure maker i.e. more the steel in a structure more is the strength of structure but we at Static Energy & its alliance believe that better the design better is the structure it is not only the steel which gives strength to the structure it is the optimum design and steel together can give the strength to structure. We design and customize the structure with less steel and more design aspect to increase the strength of overall system. Since the Govt. of India is trying to fulfill & meet the requirement of people We at Systatic is trying to match and fulfill these dream of our people by providing a top end solution in ground mounted system at topmost quality. We are helping in enhancing the generation with our overall optimized design. We Design the structure as per site need keeping the different aspects in mind i.e. wind pressure, g-force on every part of structure due to height, load ratio and other aspects and minimize the weight to save substantial amount of customers cost . We make all structure with MS and there is Hot dipped galvanization coating of minimum 100 microns of coating on it. All the accessories needed to fix the structure and panels are customized as per site so that it is easy to install and save time of the company. Also there are regular structure customized for small plants and are always in stock to serve our customers. We Here at Static Energy & its alliance ensure timely delivery with a quality product. Our Quality team ensures best in quality and good round the clock service to our clients.